A teeny tiny speaker with majorly big sound. This palm-sized Bluetooth speaker pumps up the volume and it can function as a selfie remote for phone-free photos, too. Dimensions: 2" diameter x 1.25"
Take your selfie-taking game up a notch—and into better light!—with a mobile camera lens that casts you in the best lighting. And pint-sized Bluetooth speakers can function as a selfie remote, too, for phone-free shots. The clip-on, wide-angle lens has three settings to flatter you and get the shot just right. 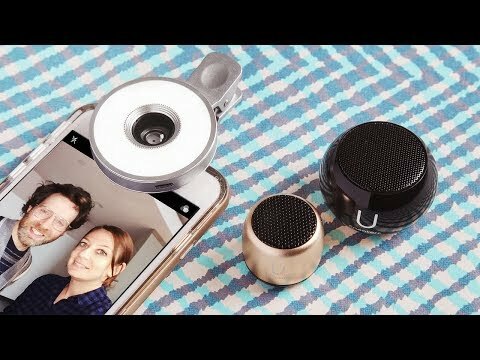 And the Micro and Mini speakers deliver full volume and deep bass in seriously tiny (like, coin- and palm-sized tiny) designs that can shoot selfies for you, without having to hold your smartphone. The Micro speaker stays charged for up to three hours, and can pair with other speakers to create a surround-sound-like experience. And the Mini can last for up to four hours of music-playing, selfie-taking fun.